29th Mar 2019 - Robot apple picking and other news! A commercial robotic fruit harvest is underway in Hawke's Bay in what's thought to be a world first. T&G has eight orchard blocks in New Zealand's Hawke's Bay region, and the company has held trials with the machine on three of those orchards on a range of varieties, according to Peter Landon-Lane, T&G's chief operating officer. More than half the cost of a piece of fruit is in labour, and it's getting harder and harder to find workers, Landon-Lane said. Gary Wellwood, who serves as global innovation manager for T&G Global, says it is innovation that doesn't mean staff layoffs. "It's going to be an enhancement to our labour need. We're looking to upskill our labour to more tree management rather than the hard work involved in picking apples," he told 1 NEWS. 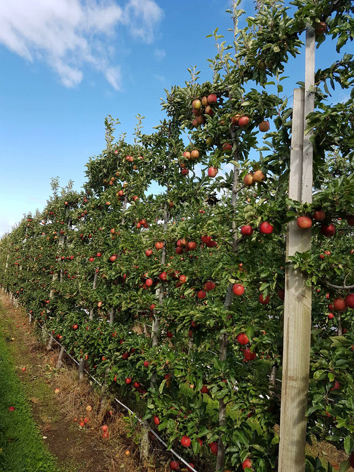 For years, T&G has been working to evolve its orchard and tree architectures to increase quality and productivity and has, in recent years, planted new orchards in two-dimensional and V-trellis systems rather than in a traditional slender spindle, COO Peter Landon-Lane said. The goal: to increase sunlight interception and the conversion of that energy into fruit, thereby improving apple quality and consistency, as well as production per hectare. 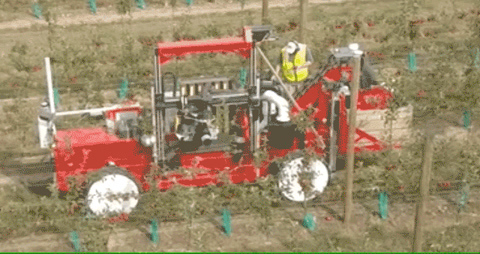 So how have T&G's orchards evolved in preparation for robotic technology? Row spacing hasn't changed much, with 3.5 meters between rows in both the slender spindle and V-trellis, and 3 meters between rows in a two-dimensional system. However, the company has increased the distance between trees, because with the vigour seen in the Hawke's Bay area, the trees are producing enough canopy to prune each tree in a two-dimensional shape. The company also is pruning branches to follow along the row, allowing light interception on all layers of the tree. It turns out those pruning and thinning decisions are more important than the details of the planting, according to Abundant Robotics CEO Dan Steere - as long as it's essentially a high-density planting on the types of dwarfing rootstocks that have been used for a long time. "Because of the evolution of the technology and the orchard itself, we will still be improving more as time goes by - fine-tuning our orchard practices in order to improve the productivity benefit we get from robotic picking, and also to use the technology as part of our overall mix of tools at our disposal," Landon-Lane said. For example, the robotic harvester can pick 24 hours a day, including at night. The machine is handling the upper portions of the orchard, "so when people come through later, they can pick all the lower fruit on the tree, reducing all those vertical miles pickers typically have to do on ladders," he said. Below: A second report on T&G Global (originally Turners and Growers) using a robot for commercial apple harvesting this week from The Good Fruit Grower which also shows some of the development trials leading up to this week's first commercial operation. The UK's largest apple and pear grower AC Goatham & Son is delighted to announce the promotion of Peter Bukowski from Production Manager to Director of Farming in recognition of his significant personal contribution to helping the business to grow. 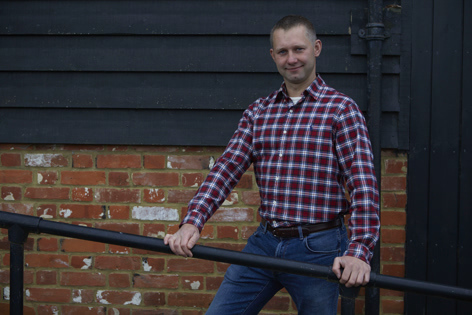 Peter has worked with Goatham's since 2012 and on joining, he was tasked with maintaining an ambitious new planting programme currently at nearly 2.5 million new fruit trees, as well as the day to day management of the orchards, sited across 28 farms totaling 2830 acres in Kent. Peter has also helped the business to revive the fortunes of British Conference Pears, one of its major objectives over the next 20 years. Over the last five years, Goatham's has embarked on the largest programme of pear planting believed to have taken place in the UK for over 40 years. This is thanks to three-year trials set up and led by Peter and his team. This is believed to be the template for how Conference Pears can be sustainably grown in the UK in the future. Award winning Peter was named the Best Production Manager at the Grower of the Year Awards 2015 where he was praised by judges for his wide and extremely diverse, all-encompassing knowledge of apple, pear and cherry production and his ability as a people person. Other highlights for Peter and the team have been winning the East Kent Fruit Society Orchard of the Year 2016 in August, with one of their Zari apple orchards at Shrubbery Farm near Sandwich, Kent. And in 2017, it scooped first prize in eight categories including Best Commercial Orchard. Peter and his team are currently planting 380,000 new fruit trees this year, just weeks after completing the planting of over 220,000 trees in 2018. 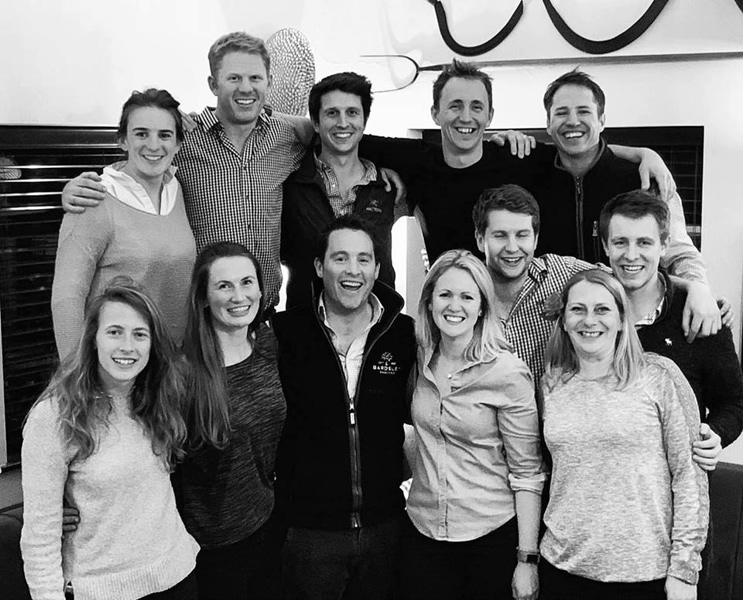 Clive Goatham, CEO at AC Goatham & Son comments: "I am incredibly proud of Peter and his team and all of their achievements which has helped our business to grow to where it is today. Peter is a very talented, knowledgeable and hard-working individual who inspires the team around him. It has been a pleasure to work with him over the last seven years and I very much look forward to what the future holds and with Peter in his new role." Peter Bukowski comments: "I am delighted to become Director of Farming and I would like to also thank the team who work with me for all of their hard work and dedication. This is a really exciting time for top fruit growing here in the UK with some new varieties and technology enabling us to grow even better quality and tasting fruit with significant yields, enabling us to compete globally with other growers." AC Goatham & Son has farms across Medway and Kent and annually grows around 300m apples and 50m pears supplying supermarkets across the UK. A C Goatham & Son began trading in 1947 as agricultural contractors and fresh produce merchants. In 1980, it established a farming operation growing apples and pears. It is now run by father and son Clive and Ross Goatham along with their business operations team and in 2017, it celebrated its 70th anniversary. The GVA contribution to the Kent economy by AC Goatham & Son is estimated to be over £13.75m per year. In 2017, AC Goatham & Son was also named The Kent Invicta Chamber of Commerce large business of the year and the Farmers Weekly Specialist Crop Producer of the year. In 2018 AC Goatham & Son were the joint winners of the Taste of Kent Awards Kent Countryside Award. 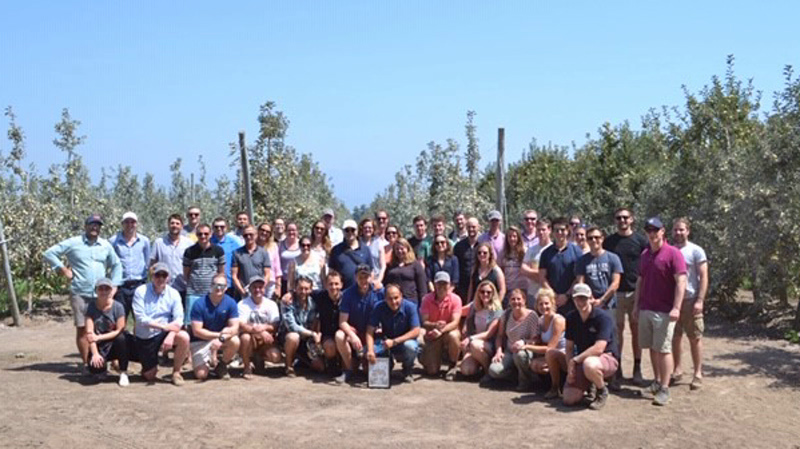 Alex Radu, fruit technical manager at Agrovista, reviews the recent Under 40s Fruit Growers' Conference trip to Chile. 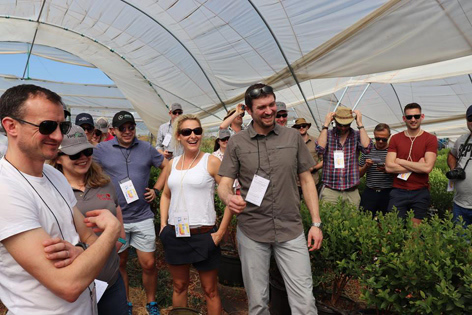 "During mid-February I was fortunate enough to accompany 48 fruit growers and industry delegates on the Under 40s Fruit Growers Conference trip to Chile, which took in some memorable highlights of the country's diverse fruit-growing sector. During the week-long tour we visited various key organisations and companies involved in the fruit chain and, of course, some of Chile's best fruit growers. With my background in disease and pest management, I found the universal adoption of (IPM) integrated pest management of particular interest, despite Chile having a much wider agrochemical armoury than we do here in the UK. This focus on IPM and targeted applications helps ensure Chile's fruit, which is a key export for the country, is acceptable to the most discerning customers worldwide. Each day also included presentations by the main sponsors, enabling us to inform delegates more about our own businesses back in the UK, the services we offer and how they can help improve a fruit growing business's bottom line. Not surprisingly, given the packed itinerary, we often returned to our accommodation rather late, but that didn't stop us making plenty of time for dinner, drinks and lots of conversation. And that's one very good reason why Agrovista is proud to be a Conference Platinum Sponsor. Front row - left to rightMaddie Cannon (2021) - Alex Myatt (2021) - Ben Bardsley (Chairman 2021) - Emily Cliff (Chair 2019) - Jim Burston (2019) - Mania Lipska (2019) - Tom Christensen (2019). The warmer weather has brought the fruit bud development on and we may be looking at full bloom in 3 weeks time! To conclude this week's Journal, it is The English Apple Man's Birthday today 29th March - The Government tried to leave the EU today, but failed, but hey - nobody can move my Birthday!!!!!!!!!!!!!!!!! !